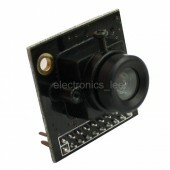 The OV3640 – 3.0 MP Camera Module w/ M12 Lens (LS-27227) is based on the OV3640 color sensor from OmniVision. The sensor has a 1/4.0″ optical format, which combined with the pixel size of 1.75 µm x 1.75 µm, results in the 3.0 MP 2048 x 1536 VGA | WVGA | SXGA | UXGA | QXGA image. This is a rolling shutter sensor, which captures an entire column (or row) simultaneously, and compiles the image by scanning across (or down). The standard lens mount for this module is the M12 mount, and includes the LS-27227 lens. The key benefit of the standardized lens mount is the simplicity in swapping the lens – fisheye, wide-angle, telephoto, zoom, IR or NoIR filter – all of which are available from DLSCorp. Note that this camera module is also available with either M12 mount or CS mount and any compatible lens sold separately – click on the Lenses category to see our complete selection. Use this camera module on a Windows, Linux, or Raspberry Pi USB connection with the ArduCAM USB Camera Shield on the primary interface (a 20-pin 0.1″ / 2.54 mm pitch interface), or your custom-built interface. ArduCAM supplies a wide variety of camera modules that are compatible with the USB Camera Shield, and all are available from DLSCorp. OmniVision CAMERACHIP™ image sensors are low voltage CMOS devices that provide the full functionality of a single-chip camera and image processor in a small footprint package. They provides full-frame, sub-sampled, scaled or windowed 8-bit/10-bit images in a wide range of formats, controlled through the Serial Camera Control Bus (SCCB) interface. All required image processing functions, including exposure control, gamma, white balance, color saturation, hue control, white pixel canceling, noise canceling, and more, are also programmable through the SCCB interface. A compression engine provides for increased processing power. In addition, OmniVision CAMERACHIP sensors use proprietary sensor technology to improve image quality by reducing or eliminating common lighting/electrical sources of image contamination, such as fixed pattern noise, smearing, etc., to produce a clean, fully stable color image. The lens has an IR-cut filter, so this camera configuration is not appropriate for IR photography.